133 Beacon is located on the south side of Beacon, between Arlington and Berkeley, with 131 Beacon to the east and 135 Beacon to the west. 133 Beacon was built ca. 1860, one of two contiguous houses (131-133 Beacon) built at about the same time in the same design. Two other houses, 127-129 Beacon, in a similar style, were built slightly later, ca. 1861. All four houses were built on land owned by William Warren Goddard and T. Bigelow Lawrence, part of a tract of land they had purchased from the Commonwealth of Massachusetts on August 1, 1857. That tract included all of the land on the south side of Beacon Street from Arlington to Berkeley. Three different builders constructed the houses: James Standish built 127 Beacon, John Danforth Dunbar built 129 Beacon, and Samuel Shurtleff Perkins built 131-133 Beacon. In each case, after the buildings were completed, the land was acquired by the builder from William Goddard and T. Bigelow Lawrence, and then the builder resold the house to its first occupant. Click here for an index to the deeds for 133 Beacon. On November 21, 1860, after completing the houses at 131-133 Beacon, Samuel S. Perkins purchased the land from William Goddard and T. Bigelow Lawrence. He and his wife, Isabella Anderson (Drayton) Perkins, lived at 119 Harrison. On September 11, 1861, 133 Beacon was purchased from Samuel S. Perkins by John Hubbard Sturgis. He and his wife, Frances Anne (Codman) Sturgis, had returned from Europe in the fall of 1861, and 133 Beacon was their first home together in Boston. He was an architect and upon returning to Boston had opened his own offices, undertaking a number of commissions in association with Gridley J. F. Bryant. In1866 he formed a partnership with Charles Brigham in the firm of Sturgis and Brigham. John and Frances Sturgis continued to live at 133 Beacon until September of 1866, when they moved to England for four years. On April 25, 1866, 133 Beacon was acquired from John Sturgis by shipping merchant Matthew Bartlett. He and his wife, Mary Eliza (Meads) Bartlett, made it their home. They previously had lived at 11 Beacon. Matthew Bartlett died in May of 1880. Mary Bartlett continued to live at 133 Beacon in 1885, but moved soon thereafter to a new home she had built at 227 Commonwealth. 133 Beacon was not listed in the 1886 Blue Book. On May 3, 1886, 133 Beacon was purchased from the estate of Matthew Bartlett by Josephine (Cutter) Burnett, the wife of Joseph Burnett. They previously had lived at 61 Commonwealth. Joseph Burnett was a chemical manufacturer and maker of flavoring extracts. He owned Deerfoot, a large summer estate and dairy farm in Southborough. In 1860, he had donated the Church of St. Mark’s in Southborough, and in 1862, he was the founding donor of St. Mark’s School in association with the Church. Five of the Burnetts’ eleven children lived with them: Harry Burnett, Josephine Burnett, John Torrey Burnett, Louise Burnett, and Elinor Burnett. Harry Burnett was associated with his father’s chemical and extract firm and later would become its treasurer. John Burnett served as assistant postmaster for Boston, then as secretary of the Boston Elevated Railway, and then as president of his father’s firm. Josephine Burnett married in October of 1888 to investment banker Charles Archibald Kidder. After their marriage they lived at 120 Beacon and in Southborough. Louise Burnett married in June of 1892 to Charles Francis Choate, Jr., a lawyer. After their marriage, they lived in Southborough. Joseph Burnett died in August of 1894. Josephine Burnett continued to live at 133 Beacon and in Southborough, and Harry, John, and Elinor Burnett continued to live with her. Josephine Burnett died in December of 1906 and her children moved soon thereafter. 133 Beacon was not listed in the 1908 and 1909 Blue Books. On May 23, 1908, 133 Beacon was acquired from the estate of Josephine Burnett by Elizabeth (Brooks) Wheelwright, the wife of architect Edmund March Wheelwright. They previously had lived at 1 Gloucester. They continued to live at 133 Beacon during the 1910-1911 winter season, but moved thereafter (he died in August of 1912). On September 13, 1911, 133 Beacon was acquired from Elizabeth Wheelwright by Frederick Oakes Houghton. He and his wife, Mary (Laughlin) Houghton, made it their home. They previously had lived at 246 Beacon. Frederick Houghton was a steamship passenger agent for the White Star Lines and other major steamship lines serving New England. On November 1, 1921, he transferred 133 Beacon into his wife’s name. The Houghtons continued to live at 133 Beacon during the 1922-1923 winter season, after which they made Milton their year-round residence. On August 8, 1923, 133 Beacon was acquired from Mary Houghton by Katharine Lawrence (Putnam) Bundy, the wife of Harvey Hollister Bundy. They previously had lived at 373 Marlborough. They also maintained a home in Manchester. Harvey Bundy was an attorney in Boston. He served as Assistant Secretary of State under Henry Stimson in the Hoover Administration, and as Special Assistant to the Secretary of the Treasury (again Henry Stimson) in the Roosevelt Administration. The Bundys’ son, McGeorge Bundy, served as national security advisor to Presidents Kennedy and Johnson. In July of 1931, when Harvey Bundy was appointed Assistant Secretary of State, the Bundys leased 133 Beacon to Erskine School. The School also maintained classrooms, offices, and dormitories at 111, 129, 135, and 145 Beacon. 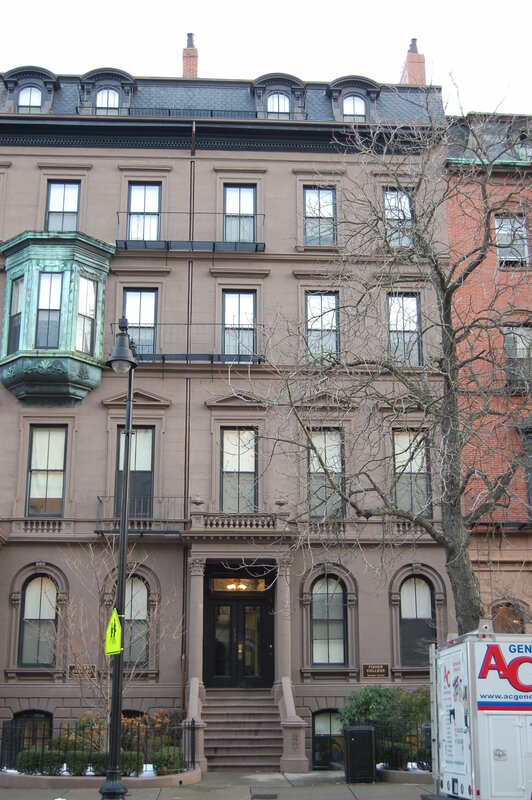 In 1933, following Hoover’s defeat, the Bundys moved back to Boston and resumed living at 133 Beacon. 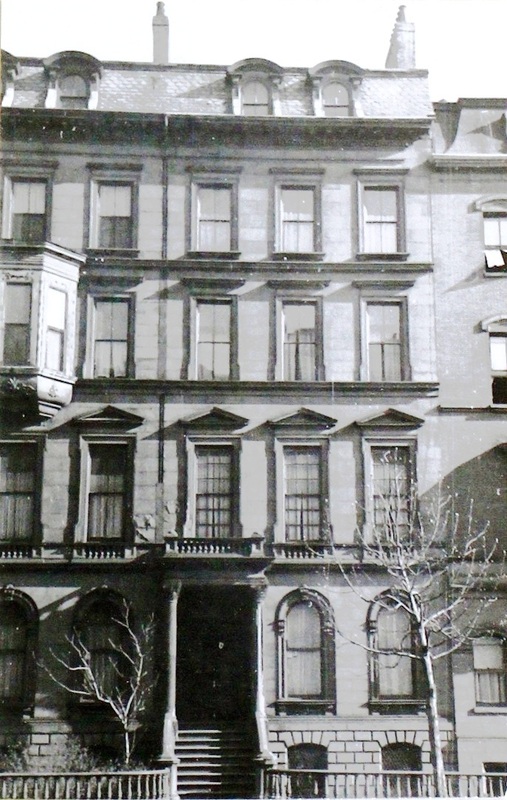 The Bundys continued to live at 133 Beacon until about until about 1947, when they moved to an apartment at 191 Commonwealth. On May 19, 1947, 133 Beacon was acquired from Katharine Bundy by the Bishop-Lee School of Theatre and Radio, located at 6 Byron. It was operated by Paul R. Bishop and his wife, Emily (Perry) Bishop. He was an engineer and aircraft company executive; she was director of the school. The Bishops moved the school to 133 Beacon and also made it their home. 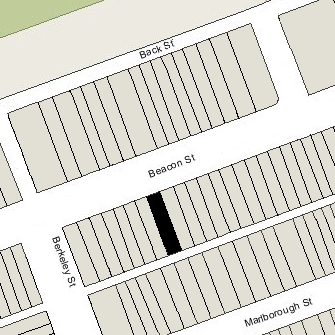 They previously had lived in an apartment at 7 Marlborough. They also operated it as a lodging house/dormitory for the school’s students. Paul Bishop died in June of 1964. Emily Bishop continued to live and operate the Bishop-Lee School at 133 Beacon. In May of 1965, the school filed for (and subsequently received) permission to remodel the basement into a dining room, and to change the use from a lodging house to a lodging house and dining room. The Bishop-Lee School continued to operate at 133 Beacon until the late 1960s. On November 25, 1968, 133 Beacon was purchased from the Bishop-Lee School by Fisher College, which continued to operate it as a dormitory and dining room. The college also owned 131 Beacon, where it maintained a dormitory. Emily Bishop continued to live at 133 Beacon in the early 1970s and to work as a teacher at Fisher College. In March of 1975, the college applied for permission to convert 133 Beacon from a lodging house and dining room into classrooms and a dining room, noting that the number of students who resided in dormitories had declined. At the same time, it also sought to convert 131 Beacon into classrooms. The applications were denied and Board of Appeal refused to grant the college’s appeal. In March of 2002, Fisher College filed to change the legal occupancy of 133 Beacon from a lodging house and dining room to a dormitory and dining room, legalizing the existing use as a dormitory (rather than a lodging house). In June of 2003, the Board of Appeal approved the change in use, with a “sunset” proviso specifying that the use would expire on June 30, 2006. The permitted use was subsequently extended and remained in effect as of 2015. As of 2015, Fisher College owned 102-104–106–108–110–112–114–116–118 Beacon, 111 Beacon, 115 Beacon, 131-133 Beacon, 139–141 Beacon, 1 Arlington, and 10-11 Arlington.